Below is the text of the speech made by Ed Miliband, the Leader of the Opposition, to Labour’s Youth Conference on 16th March 2012. It’s great to be here at this Labour Youth Conference. You know you can judge a party and its prospects for the future by how it’s performing amongst the young. Idealism demonstrated at campuses all around this country where it is Labour students who are campaigning for justice and fairness at work. By campaigning for their universities to adopt a Living Wage. Let us applaud their energy, their spirit, their idealism today. Idealism demonstrated by our young councilors, some of them just 18. I spoke to one of them, Jake Morrison, one of the youngest Labour councillors in Britain, elected at last May’s elections. He is serving the Wavertree ward in Liverpool, campaigning for safer streets and against this government’s NHS Bill. Let us recognize the efforts of Jake and all our young councilors, let us applaud them. And let us applaud our party members too. We’ve had tens of thousands of people join us since the General Election. And I can tell you that the number of people under 27 in our party has doubled in the last three years alone. Coming to Labour to change our country. Let us applaud the energy, spirit, and idealism of all those who have joined our party. And we need that energy, spirit, and idealism because of the challenges facing Britain, and our young people. Under this government, more than one million young people out of work. Like the young woman I met recently at a youth centre in London. She had sent off 137 CVs, and hadn’t got a single reply. The only job she could find, cash in hand, for less than the minimum wage, working for a couple of months at a fish and chip shop. She was desperate to work but felt she was banging her head against a brick wall. Friends, she is a not a layabout. She has hopes and dreams for the future. Her problem is she hasn’t been given a chance. She doesn’t have a government which matches her ambition. And what’s true of her is true of the vast majority of those one million young unemployed in this country. They’re not workshy, they’re not scroungers, they just need the chance to work. Huge potential going to waste. You judge the future of a political party by whether young people want to be part of it. But you judge the future of a country by whether young people feel they have a part in it. That sixteen year-old was a member of my family. Not me, but my Dad. He wrote those words just after he arrived in Britain, a Jewish refugee from Belgium in 1940. He arrived here with his father, separated from his mother and sister. After six months of scraping a living doing odd jobs. And three months after that, he was accepted into Acton Technical College. He studied at night, in the one room which he shared with my grandfather so he could learn English and pass his exams. It was his hard work that meant eighteen months after arriving at Dover, he won a place at the London School of Economics. After that, he never looked back. He succeeded because he was given a chance. And that was matched by his sense of striving. He went on to become a university professor himself, wrote books, and his teaching inspired many young people. He met my Mum here and they raised a family. He is still an inspiration to me. Hard work — and its value. The genius of it was that it wasn’t some ‘eat your greens’ lecture. At least most of the time it wasn’t. It was just a sense that you shouldn’t waste your potential. And they also taught me something else born of their experiences. Two people rescued out of the darkness of the Second World War. And they taught me a simple lesson. That you had a responsibility to leave the world a better place than you found it. And no challenge or injustice was too big for us to overcome. I tell this story because it’s what helped make me the person I am. Today, we live in a very different time. Compared to the challenges my parents and their generation faced, ours do not seem large. A country shattered by war. Facing the costs of reconstruction. No NHS, no proper welfare state. But the strange thing is that there is more fatalism about what happens in the world. More cynicism about the ability of any politician to make a difference. Not to lessen our ambition. To convince people that there is a clear and realistic vision of a better future. Let’s deal with this government first. They’ve got no compelling vision for the future. Even Vince Cable says so. It has no sense of ambition. All it knows is austerity. And it has no sense of responsibility. What have they done to young people? They scrapped the Future Jobs Fund which provided real jobs. The number of young people looking for work for more than six months has doubled over the last year alone. And there are 49.000 young people who have been looking for work for over a year. Two and a half times more than there was a year ago. And what is their solution? A Work Programme which doesn’t guarantee work. And a Jobs Programme which doesn’t guarantee jobs. Do you know that young people can be left languishing on their programme for 1 year, 2 years, 3 years under this government, without finding work? What greater example could there be of the lack of ambition of this government? Work experience of course has a role to play, but it cannot be the summit of our ambitions. There is only one solution to a jobs crisis. No young person should be left languishing on the dole for more than a year. It is not the Britain I believe in. It is not the Britain you believe in. And it is not the Britain we would have under a Labour government. To conquer long term youth unemployment. The first line of a Labour Budget would be a tax on bank bonuses to get young people into work. To business we say: we’ll pay the wages, if you provide the training. To young people we say: if you’re out of work for a year we’ll guarantee you the opportunity to work. Responsibility on the part of government to give every young person a chance. Responsibility on the part of employers to make that chance real. And responsibility on the part of young people to take that chance. Under Labour, a job is guaranteed. At least at the minimum wage. Real jobs, Real wages, a real chance for our young people. If I was the Prime Minister, I would seek to mobilize every business in Britain, every voluntary sector organization, every young person too, behind this effort. I would never stand by. Labour would get our young people working again. When I met the young woman who had handed in 137 CVs, just down the road from the City of London, she asked me how it was possible that in the banks a few miles away, these vast bonuses were still being paid to some of people who caused the financial crisis in the first place. Her friend said: they seem to be carrying on as if nothing has happened, and we are paying the price. By taxing the bank bonuses to help the young unemployed, we are doing more than coming up with a new programme. We are saying something about who we are as a party. We are saying something about what we aspire to be as a country. We all owe obligations to each other, however rich or poor we are. And when we talk about the bonus tax for youth jobs, we are showing the difference in our priorities, even in tough times. We are on the side of those who work hard, strive, play by the rules. Labour priorities versus Tory priorities. Their priority is to cut taxes for people who have a job and earn over £150,000 a year. And they say we’re all in it together. Our priority is to stand up lower and middle income families and for our young people who just need a job. And it’s right for the country. But it’s not enough just to convince the public that we’re decent people with better priorities. We have to show people that we can manage our priorities and manage their money. Including when there is less money around. And so the challenge we face is a demanding one. To show our radicalism, ambition and vision, even in tough fiscal times. Not to measure the success of the next Labour government by the money we spend but by the difference we make. But I know we can make a difference. By showing our different priorities. Like we do on the bank bonus tax for youth jobs. Not going ahead with the government’s tax cut for the banks. And investing in the young people of Britain. These are just downpayments for the change a Labour government would bring. A downpayment for the change and ambition this country needs. 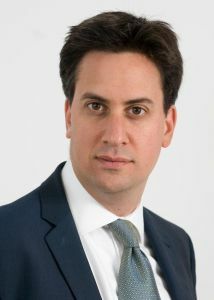 But our challenge isn’t just to create jobs for young people, or to cut tuition fees, important though that is. It is to shape a new economy. The old economy, the one which seemed to work during your parents’ generation, just won’t do any more. Not just because of the banking crash. But because even before then, it was serving the few at the top, not the majority. It created some high paying jobs in financial services. But too often, low-wage, low-skill jobs, without good prospects. Your generation needs not just more jobs, but good jobs. We need an economy that is about proper training. I met a group of apprentices here in Warwick at Jaguar Land Rover a few months back. Their eyes sparkled with excitement about what they were doing. Not everyone can be a racing car apprentice. But there can be a lot more apprenticeships. A Labour government ambitious for the future will insist that every business which gets a large government contract must provide apprenticeships for the next generation. To create an economy that works for working people, we need to back our small businesses, to help them get the finance we need. A Labour government ambitious for the future would reform finance by planning for a British Investment Bank to help those entrepreneurs create the jobs we need. To create an economy that works for working people, we need to make low-carbon growth a priority. A Labour government ambitious for the future would understand that tackling climate change and a good economy are not in conflict, as George Osborne says, but going hand in hand. To create an economy that works for working people, we need fair rewards from top to bottom. An ambitious Labour government would reform our system of top pay and make sure there’s an ordinary worker on every remuneration committee. To create an economy that works for working people, we need to work together to hold power to account wherever it lies. That’s why a Labour government, ambitious for the future, will work to reform the way our energy market and train companies work, and fight for the consumer and ordinary citizen. And will stand up to vested interests without fear or favour. We know that none of this will be easy. It will not be easy to create a country we believe in. To create a country fit for our young people. We will face many challenges. Old orthodoxies about the way our economy is run. Powerful vested interests who don’t want change. However difficult the circumstances, no injustice, no challenge is too big for our country to overcome. No injustice, no challenge is too big for our party to overcome either. I will never shrug my shoulders at the sight of one million young jobless. That’s the difference with Labour. I will never accept an economy which doesn’t work for working people. I will never accept that there are interests which are too powerful to be held to account. Even in tough times, we can deliver fairness, justice, responsibility, the values we believe in. That is what should drive us on. That is what we will campaign for in the council elections. That is what will enable us to win back trust. That is what will win us the next general election, and enable us to transform the country.